Cooler temps don’t keep Melissa and Valmar Nunes and their adorable pup, Mason, cooped up indoors. 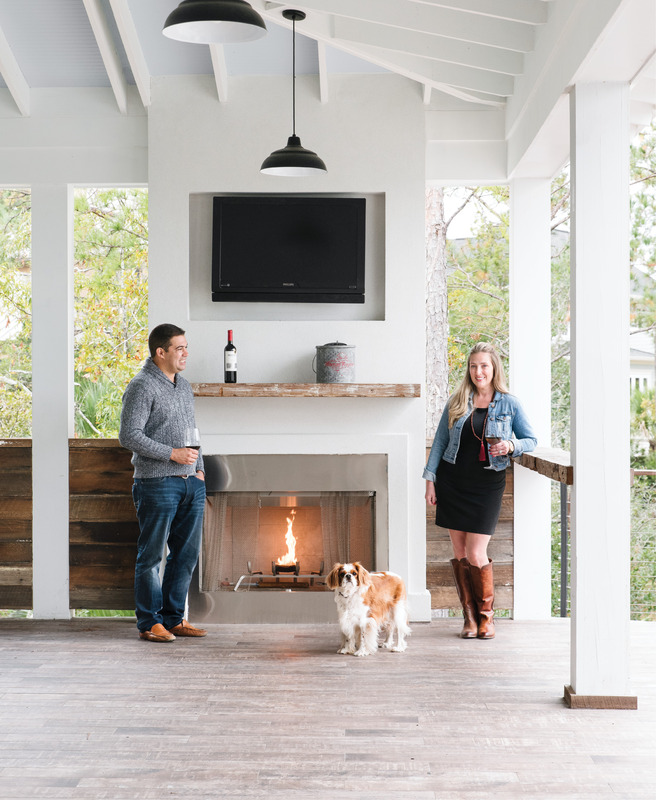 The couple designed their RiverTowne abode—complete with a marsh-front pool, open-air kitchen, and this alfresco fireplace—for outdoor entertaining year-round. High Five: The Nuneses opted to elevate the “farmhouse” structure to prevent flooding and optimize the Wando River views. White Out: Melissa describes her home style as clean-lined and coastal. All-white built-ins and furnishings in the living room feel fresh, while acacia wood floors warm the neutral palette. In the otherwise open layout, a wraparound fireplace helps to create distinct zones for lounging and eating. 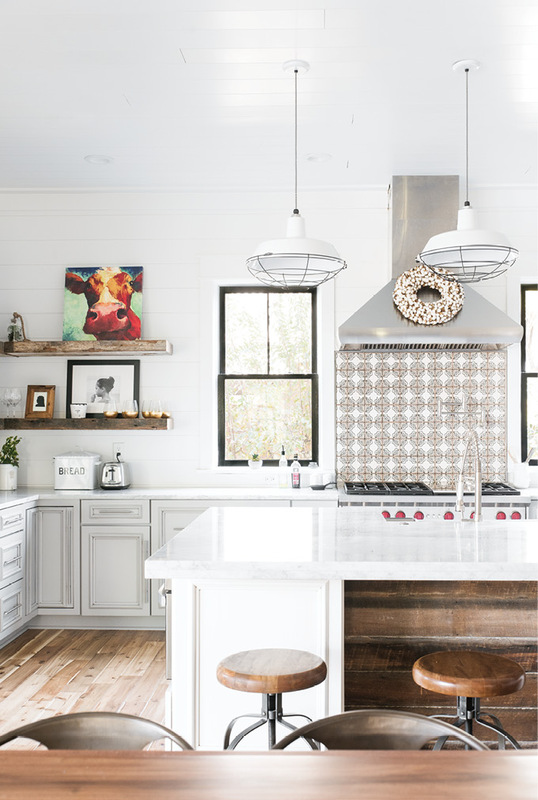 Smart Buys: The kitchen is home to some of Melissa’s favorite bargain finds, such as the vintage-looking tile from Overstock.com. 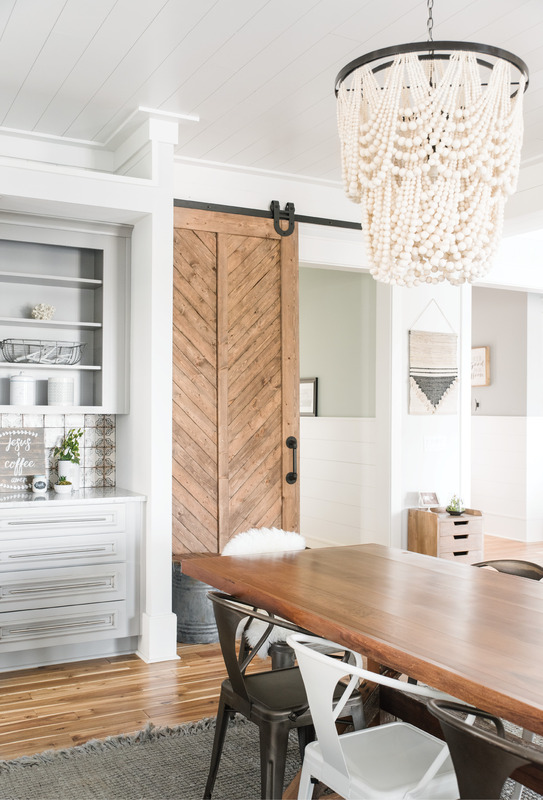 In the Mix: A wooden bead chandelier and an eclectic mix of chairs around the farmhouse table lend casual elegance to the dining area. Open-Door Policy: A roll-up glass door connects the pool-house kitchen with the patio; a miniature version links to the outdoor bar and grilling station. Mount Pleasant-based Aquatica Pools and Spas built the heated infinity pool, which overlooks the marsh and the Wando River. 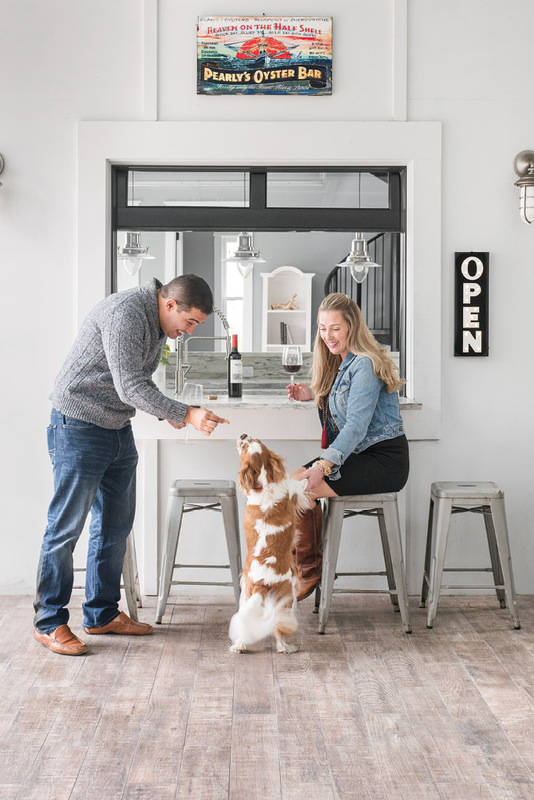 Fun for All: When they’re not swimming—the water’s a cozy 85 degrees—Valmar, Melissa, and their pup, Mason, can often be found relaxing in the outdoor living space, complete with a bar. Bunk House: In eight-year-old Cruz’s room, soccer-themed bedding from Wayfairer.com adds a kid-friendly dose of color to shiplap bunk beds. A few lengths of pipe and fittings make for a stylish rail on the top bunk. The second floor of the pool house boasts built-in beds in four cozy alcoves so overnight guests are always welcome. 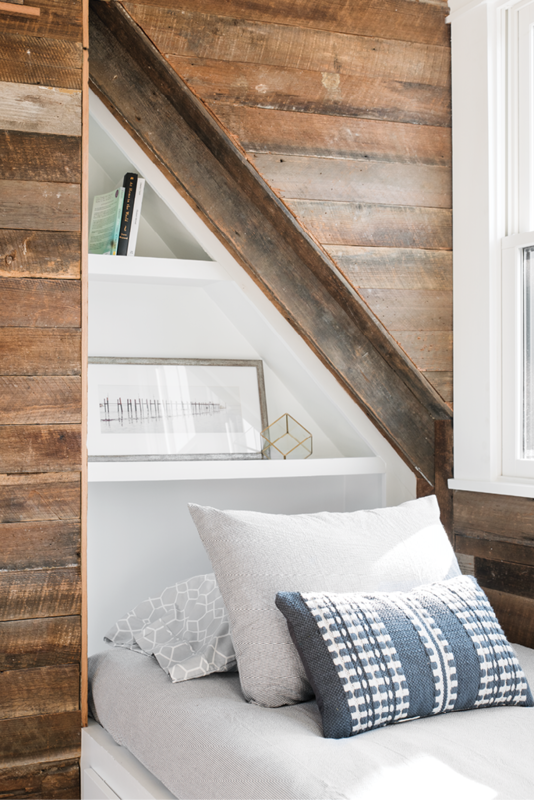 Clever Quarters: Reclaimed wood paneling and geometric built-ins strike the right balance between warm and modern in the guest space. Since moving stateside in 1999, Valmar has continued the tradition, making a point to regularly cook Brazilian fare and dine alfresco with Charleston-born Melissa and their three kiddos: Teghan, 19; Riley, 12; and Cruz, eight. It’s no surprise, then, that in 2014, when the couple set out to design and build a home in Mount Pleasant’s RiverTowne neighborhood, an open-air living space outfitted with a kitchen was priority número um. In terms of residential design, this wasn’t their first rodeo. Valmar, a builder by trade, helms Guaranteed Framing, which frames up hundreds of new homes in the Lowcountry each year, as well as Master Home Builder. 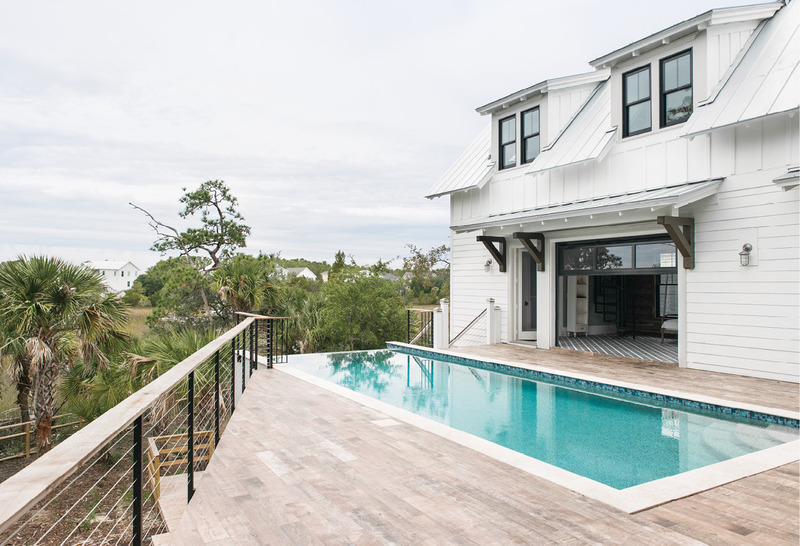 Over the last 13 years, he and Melissa, with her knack for interior design, have renovated and custom built seven residences, from a West Ashley fixer-upper to a new build on Daniel Island. 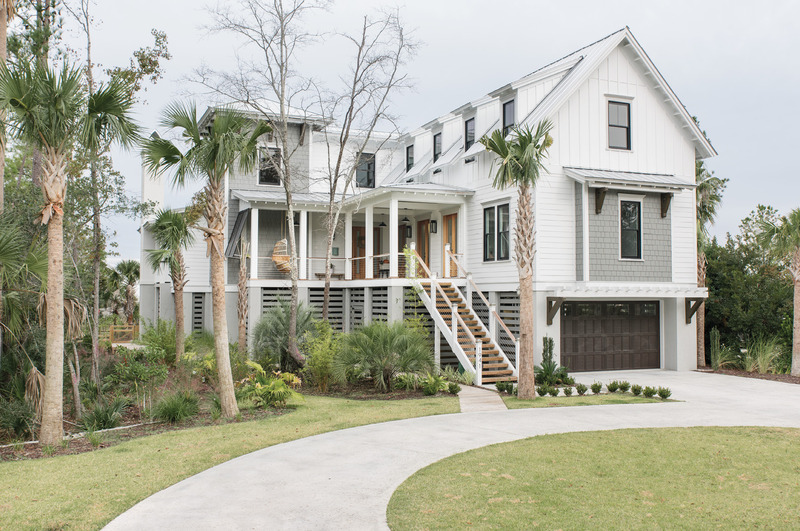 By the time they came across the unique half-acre lot in RiverTowne, the couple had a clear vision of their dream domicile: a clean-lined but cozy abode on the water where they could artfully blur the lines between outside and in. Melissa and Valmar fell for this particular parcel’s long views of the Wando River. They were also attracted to RiverTowne itself, citing the natural beauty and salt-marsh vistas of the quiet golf community. But the land presented some challenges, too: shaped like a triangle, the lot is bordered by marsh on two sides, making it tough to carve out space for a traditional backyard. “At first, it was difficult to figure out how to get everything situated,” Melissa notes. 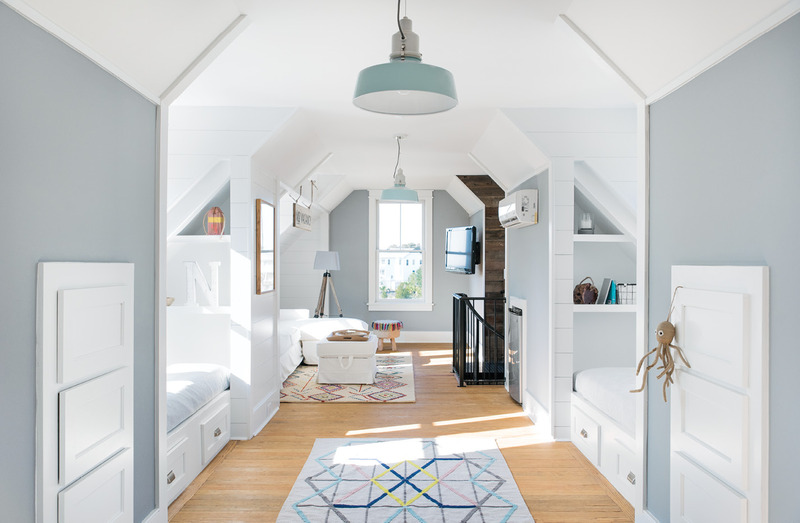 Undeterred, she and Valmar drew up plans for a 6,000-square-foot modern farmhouse that, thanks to a T-shaped layout, made the most of the angular tract. With the design ideas in place, they enlisted area structural engineer Matthew Wilks of MW Design, LLC for help drawing up the plans. From there, Valmar’s firm, Master Home Builder, built the place from the ground up, with construction wrapping in 2016. Situated within the T’s would-be negative space is the home’s ne plus ultra: an elevated back patio overlooking the Wando. From this perch, a travertine-bordered infinity pool draws the eye into the landscape, where Melissa says she often spots egrets taking flight. The pool deck itself feels connected to the terrain, too, and not just because of the fiddler crabs that congregate there during high tide: it looks like wood, but it’s actually a low-maintenance faux-wood tile. 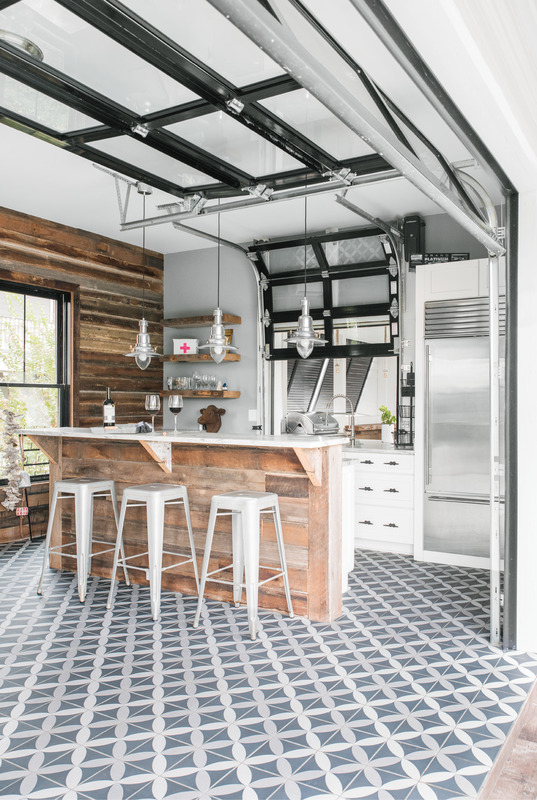 “I like it because it’s got a little bit of traction, you don’t have to worry about splinters, it doesn’t get too hot in the summertime, and you can just spray it off—but it has the warm look of reclaimed beams,” Melissa notes. But the raised patio is more than a place for swimming, sunning, and watching wildlife. 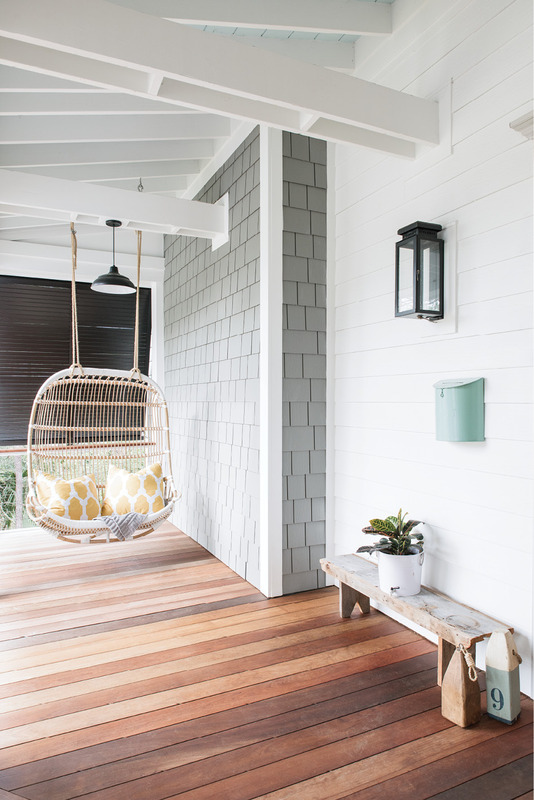 It’s truly an outdoor living room for all seasons. During chillier months, the Nunes clan can be found gathered around the plein-air fireplace or taking in an Alabama game on the outdoor flat-screen. “You’ll hear us yelling ‘Roll Tide’ for sure,” Melissa says. Perhaps their favorite spot to hang, though, is the outdoor kitchen. Outfitted with top-of-the-line grilling equipment, it’s certainly fancier than the front-yard set up Valmar enjoyed back in Brazil, but the spirit is the same. And lest the cook feel lonely at his post, the open-air scullery is situated right next to the pool house, which boasts a kitchen of its own. A roll-up window links the two, creating a natural space for an outdoor bar. “This design lets you stand at the grill and pass dishes to people who are cooking or eating inside,” she says. Inside the home’s main structure, a generous allotment of windows and sliding-glass doors brings river views—not to mention easy patio access—into most every room. A variety of houseplants reinforce the connection with nature, while acacia floors and reclaimed wood accents add a sense of earthiness throughout. 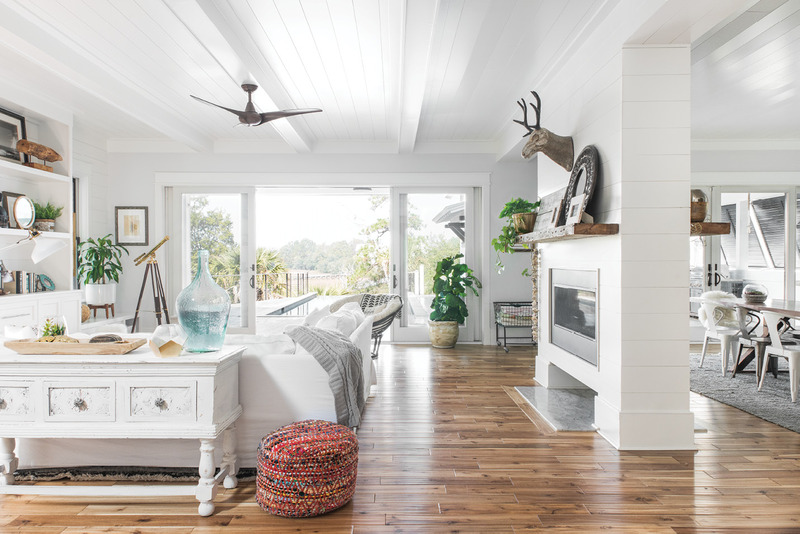 On the walls, wide-plank shiplap feels distinctly coastal, yet modern and clean. The overall effect is luxe, but Melissa prides herself on seeking out budget-friendly finds. “I’m all about things that are stylish but don’t break the bank,” she says. In a genius cost-saving move, Melissa transformed a slightly damaged, discounted blue bureau from Steven Shell Living into a vanity that wound up in Cruz’s bathroom. “It was a little dinged up, but once we put a sink on top, the flaws weren’t even visible,” she notes. For her part, Melissa is known to help whip up some of the family’s other signature dishes: salpicao, a Brazilian chicken and potato salad; rice; and feijoada, a black bean stew. But perhaps most popular is the caipirinha, Brazil’s national cocktail made from sugar-cane liquor, limes, and sugar. For the couple’s friends, sipping one of these while overlooking the marsh or taking a dip in the heated pool is like a mini-vacation. To which we say: ¡Felicidades!